At Aegis Living, the Life Enrichment program is not just a major part of keeping seniors with Alzheimer’s happy, but it’s integral in helping them maintain physical and emotional well-being as well as promoting cognitive function. That’s why each community has its own Life Enrichment team that organizes daily activities for seniors and encourages residents to pursue a past interest, develop a new hobby or make a new friend. At Aegis on Madison, Curtis Knopf serves as the Assistant Life Enrichment Director, and he has special insight into the unique and intriguing characters that reside at the community. He’s has even helped form an exciting organization – the fly fishing club – that embraces some of the residents’ love for this angling sport. The bi-weekly club only started meeting three months ago but, as Knopf explained during an interview, it has proven hugely successful in encouraging seniors to pursue their passions as well as in providing mental stimulation. Q: What inspired the seniors at Aegis on Madison to start a fly fishing club? 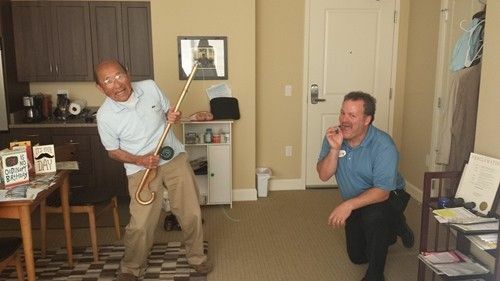 A: Fred Shirosaki wears a T-shirt that says “fly fishing is life.” I used to be a fly fisherman, and he was an avid fly fisherman for five decades. He just kept talking about it, so I just put it on the calendar – “fly fishing club.” He showed up with his tackle box, and then a couple weeks later we discovered there was another great fly fisherman living here: Bob Barr. Now the three of us are the core of the club. … I wish there were more people but in some ways it’s almost better that it’s a little club. I think we’ll have a few more people, but the two men that we have in the club are amazing fishermen. Fred tied his own flies. There’s this great fly called the Nyerges Nymph. Before I met Fred I had no idea this fly was named after a man. He used to fish next to this guy Nyerges, and Fred was a member of the Spokane fly fishing club for ever and ever. He even taught fly fishing to kids for two decades. We started it really because of love of fly fishing. For him, it’s about spirituality. Fly fishing is church for him. There’s sacrament to it. You don’t call it a fly fishing pole – it’s a rod – you don’t cast with your wrist. … (laughs) believe me he gets angry at me. And we started it because of his desire for purpose. That’s really our goal in Life Enrichment is to find a purpose. And it just changed him. He’s a natural leader. He’s taught me so much and I sort of fulfill the role of those kids he was teaching years ago. Q: So it’s more like they’re teaching you rather than you leading them? A: Yea, I should be paying Aegis to learn this much about fly fishing. I really do appreciate this fly fishing club. These guys are just full of information. Bob was telling me how trout see. His dad taught him that trout can only see – like if you hold your hand up in a V above your head – that’s all that trout can see, they can’t see to the side. He taught me how trout actually see the fly in the water, and he taught me all these tricks about where to put the fly so the fish can see it. What they’re really doing is letting out there secrets to somebody, and if we didn’t have a fly fishing club they’d just be silent – they wouldn’t have a place to share these stories, that’s another part of it. Q: How else has the fly fishing club benefited residents? A: Storytelling and going through their memories is a big part of it. Bob Barr likes telling stories about how he fished in Everett. Cutthroat are this saltwater trout, and Bob’s eyes just sparkle when he talks about how his father taught him how to fish them. Bob has caught many, many fish, but the one fish that he really loves is the sea run cutthroat. Every time we have these clubs, he talks about these memories. See, they were retired businessman and really just had this passion for fly fishing. There are seven dimensions of health and wellness we practice in Life Enrichment, and fly fishing is one of those perfect activities that brings all of these elements together. There’s a physicalness to it and it’s definitely emotional. It’s environmental, it’s spiritual, and it’s definitely intellectual, so you get all of these benefits. Q: So you believe it has cognitive benefits for seniors? A: I’m sure it does. It would be fun to actually see before and after, like if would could take scans of the brain or something. But the cognitive part – we know that social interactions help cognitive. Anytime there’s physical interactions – the tactile, using your fingers. Singing, we’re finding that with any kind of meditation or mindfulness it helps the brain. … If you can be in the now – if you can just forget about the past and the future, not worry and just be in your own skin, tying lines and doing those involved things – there’s research that shows it rebuilds brain tissue. When I’m doing activities with the seniors, I try to get them in the mindset of ‘we’re here now.’ I get all types of interactions with them if we’re not in the moment with our seniors. Showing pictures of the past or saying “we’re going to go fishing in the future,” that’s not the interesting stuff, When you can be in the now and doing something – making blankets, tying lines, casting fly fishing rods, all those activities seem to help. People are getting better here. Q: This notion of giving seniors purpose, that’s part of the Life Enrichment program, right? A: Yea, it gives them purpose, and that’s why Bob Barr’s Daughter wants Bob involved in this fly fishing club. This livens him up, it brings energy. You know, for these guys, it’s intellectual. They were important businessmen and they had their own lives, then they went to this hobby. They didn’t do it at a level of casualness. They invested themselves daily in fly fishing, and to bring back that sense of passion – it’s fun to see that sparkle in their eye. You really see it.